For more than twenty years, FMO, the Dutch development bank, has been a valuable financial and nonfinancial supporter of Accion’s work. Together, we have built a partnership based on a shared commitment to entrepreneurs, innovation, and strong governance of financial institutions. FMO is committed to becoming a “preferred partner to invest in local prosperity,” and alongside Accion, it has found unique opportunities to achieve that. 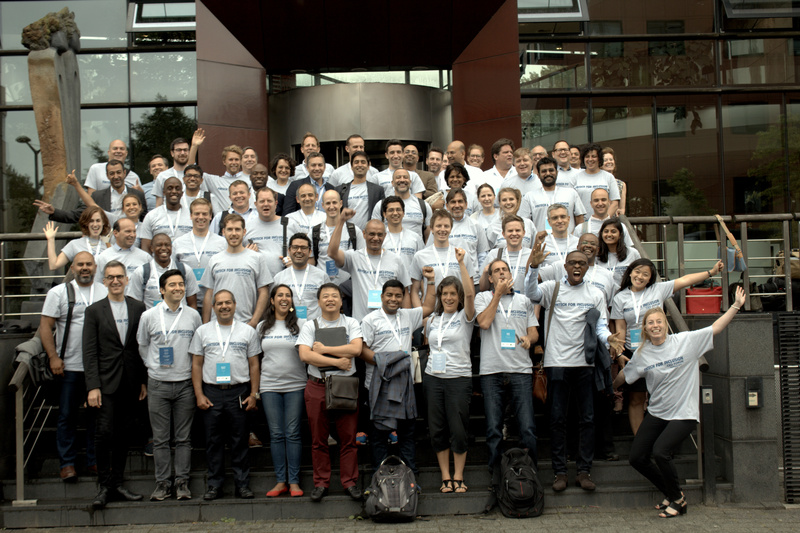 In June 2017, FMO, Accion Venture Lab, and Quona Capital hosted the CEO Forum and Fintech for Inclusion Global Summit 2017, a unique, two-day gathering that brought together more than 40 Accion Venture Lab, Accion Frontier Inclusion Fund, FMO, and Catalyst Fund partner CEOs. On the first day, the executives came together to exchange insights on key leadership and strategic business challenges facing inclusive fintech startups, and opportunities to overcome them. The following day, the Fintech for Inclusion Global Summit convened our CEOs with more than 200 ecosystem partners – impact investors, bankers, venture capitalists, and other financial inclusion industry leaders – who could help their businesses grow. The event fostered a peer-learning community to advance participants’ shared interest in innovation and inclusive finance. FMO Accion Venture Lab, Accion Frontier Inclusion Fund, and Catalyst Fund partner CEOs celebrate at the conclusion of the 2017 CEO Forum. Since 1996, FMO has been a supporter of one of Accion’s signature projects: BancoSol in Bolivia, which Accion helped found in 1992 as the world’s first commercial bank dedicated to microfinance. One of Latin America’s leading microfinance institutions, BancoSol’s success over the decades has demonstrated that microlending can be both financially profitable for lenders and economically transformative for clients. For more than two decades, FMO and Accion have worked in tandem to provide capital, advice on corporate governance , and world-class technical assistance to microfinance institutions in developing markets—most recently in Myanmar, through our work with DAWN Microfinance, a lender to microentrepreneurs in Yangon and other urban and peri-urban centers throughout the country. FMO has been a champion of strong corporate governance practices for financial institutions, supporting initiatives like the Africa Board Fellowship (ABF) program. A project of the Center for Financial Inclusion at Accion, ABF provides mentorship and peer learning exchanges to strengthen the governance of financial institutions serving low-income clients throughout sub-Saharan Africa. FMO has also supported and attended leadership seminars with Accion throughout the world, bringing key stakeholders together to discuss issues of governance and risk. The Smart Campaign, a project of CFI, is a global campaign committed to embedding client protection practices into the institutional culture and operations of the financial inclusion industry. FMO has been a key partner to the campaign, leading the consumer protection agenda with investors and encouraging the development of standards for new inclusive finance institutions. They have worked with the Campaign in the areas of responsible finance for refugees and responsible consumer lending, and are actively supporting our work to establish standards for fintech investors that ensure client protection is a part of investment decisions. Today, Accion’s work with FMO continues. Among other projects, we are exploring the expansion of the Africa Board Fellows program and developing practical guidance for stakeholders in designing the governance of early-stage companies. In FMO, Accion has found a valuable partner with which it can support entrepreneurs and institutions around the world who are building a more inclusive world.